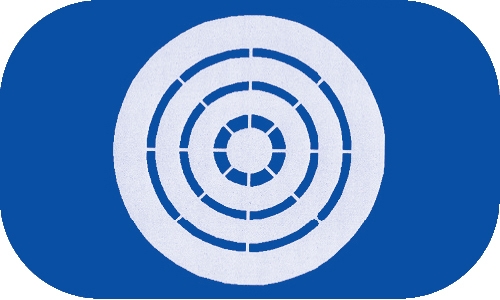 Within the wide range of products for your works and installations where you need diffusion products, at BRINNER we offer a wide range in all types of return and impulse gratings, grids for circular ducts, adjustable multi-nozzles and diffusers of evaporative equipment capable of satisfying the most demanding needs of any project. GRIDS IHV + O MODEL: Double deflection impulse grilles with flow regulation. RH MODEL GRIDS: Horizontal slat return grilles fixed inclined at 45°. 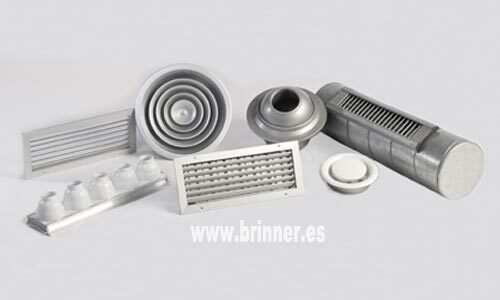 In cases where you need to install a grid for circular duct, be it single or double deflection or even with SGRDA regulation, in BRINNER we offer you a wide range of possible dimensions for ducts of circular sheet up to 1400 mm in diameter. We can also offer adjustable multi-nozzles in pieces of 5 or 10 nozzles for different diameters of sheet metal ducts (150 to 250 mm or 300 to 600 mm). 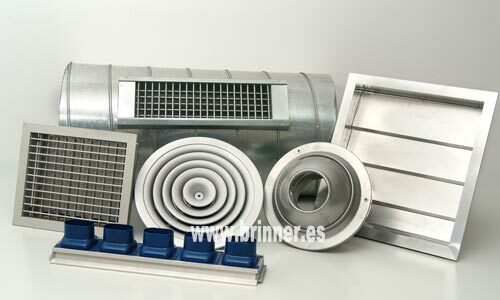 In BRINNER we offer a wide range of diffusers for evaporative equipment made of galvanized steel or stainless steel AIS-304, with several possibilities and combinations depending on the number of grids you need (2, 4 or 6) and type of duct mouth sheet metal (be circular 600 mm diameter or rectangular 550×550 mm).